The following families have genealogy eBooks on this page: Appleton, Barry, Carver, Dickey, Dodson, Ferris, Fox, Goddard, Gurley, Hooper, Jones, Latimer, Liddle, Mann, Martin, and Sigourney families. Welcome to Bookshelf 21 at Hawkeyes Trading Post! Appleton Family History and Genealogy. PDF eBook English 2.43 MB 1873. Samuel Appleton was born in Little Waldingfield, England, and married Judith Everard in 1616. The family came to the American Colonies around 1650. There are 7 generations documented with essential dates for descendants ranging from 1586 to 1872. Although the ink was faded with time the publication is still very readable, and is a wonderful resource for Appleton genealogy! Price $6.95 USD. Carver Family History and Genealogy. PDF eBook English 6.29 MB 1903. William Carver came to the American Colonies aboard the Samson about the year 1682. He and his brothers were members of the religious Society of Friends, and they settled in Byberry, Pennsylvania. There are 7 generations of descendants documented with essential dates that range from the year 1682 up to 1890. An index of 14 pages provides over 1200 names of Carver family descendants and in-laws! 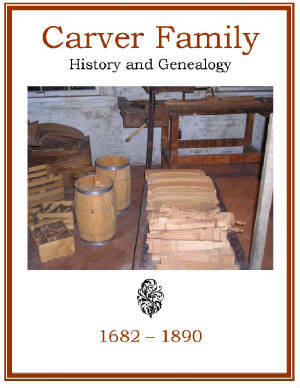 An excellent resource for the Carver family genealogist! Price $6.95 USD. Dodson Family History and Genealogy. PDF eBook English 18.6 MB 1908. This publication contains historical and character sketches along with the 1784 escape by canoe down the Susquehanna River from a Native American war party, which burned down the pioneer home of the Dodson family. Essential dates for descendants range from 1632 up to 1907, a period of 275 years! There are several ancestral photographs, poetry, and an 18 page index containing over a 1000 names of family members and in-laws! 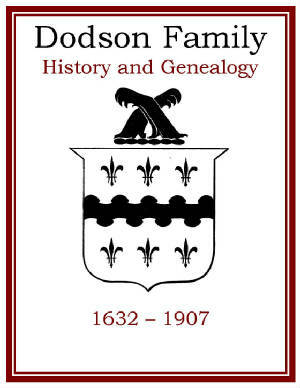 A great resource for Dodson family genealogists! Price $6.95 USD. Fox Family History and Genealogy. PDF eBook English 1.04 MB 1915. 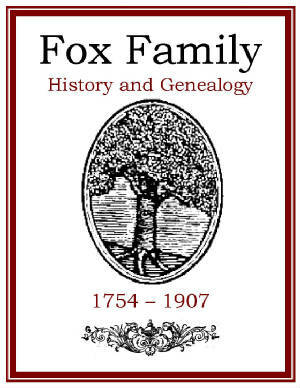 The Fox family origins reaching back to Holland and England, with an interesting legacy to the Quakers, is contained in this 27 page publication. Essential dates for listed descendants of John and Catherine Fox range from 1754 to 1907 covering a period of 153 years! This may be a very unique resource for Fox family history and genealogy! Price $6.95 USD. Gurley Family History and Genealogy. PDF eBook English 13.6 MB 1897. Ingelram de Gurley accompanied William the Lion from Normandy to Scotland in the year 1174 according to family lore. William Gurley was born in Inverness, Scotland in 1665, and another William Gurley was born in Wexford, Ireland in 1757 a descendant of James Gurley of Scotland. Essential dates and names range from 1665 to 1892 on this very ancient family line. 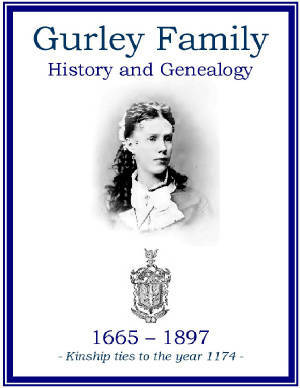 A well articulated, and documented, resource for the Gurley family genealogist that will extend the family line into the distant past! Price $6.95 USD. Jones Family History and Genealogy. PDF eBook English 10.2 MB 1903. David Jones was born in 1709 the son of a Clergyman in Wales. David and his stepmother didn’t get along well, and he ran away from home at the age of 12 crossing the Atlantic to reach the American Colonies. In 1735 he married Elizabeth Davis and moved to the Conestoga Valley establishing a village called Churchtown. Essential dates for descendants range from 1709 to 1901, a period of 192 years! There are many rare photographs. The print is faded with time, but still quite readable. What are the chances you are related to this brave young lad? What a tale! 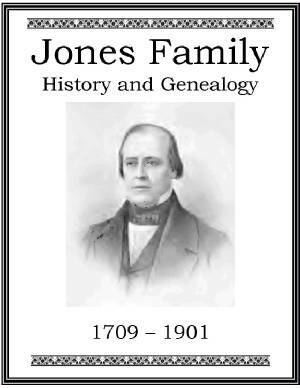 This is a wonderful resource for the Jones family genealogist! Price $6.95 USD. 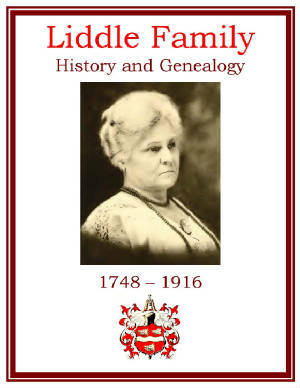 Liddle Family History and Genealogy. PDF eBook English 3.53 MB 1916. John Liddle born in Roxburghshire, Scotland in 1748 cam to the American Colonies in 1775 with his brother Robert and Roberts family. John was a drummer and fifer during the American Revolution. 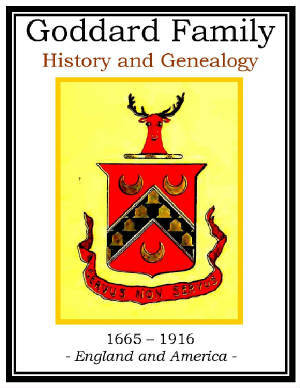 This wonderful resource has poetry, a great pedigree chart, the Liddle Coat of Arms, a 6 page index with over 300 descendants and in-laws, and many rare ancestral photographs. A well articulated description of the Scottish homeland. A fine resource for the Liddle family genealogist! Price $6.95 USD. Martin Family History and Genealogy. PDF eBook English 12.5 MB 1918. On March 20th of 1635 they left Badcombe, in Somersetshire, England and arrived at Weymouth in the American Colonies on May 6th of 1635. This well articulated family history contains numerous rare ancestral photographs, many letters, poetry, Last Will and Testaments, a roster of family members who served during the American Revolution, and a nine page index containing over 800 names of family members and in-laws. Vital dates, and names range from the year 1633 to 1918. 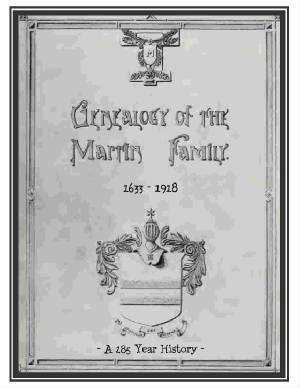 A great source of documentation, and family history for the Martin family genealogist! Price $6.95 USD. Barry Family History and Genealogy. PDF eBook English 5.33 MB 1906. 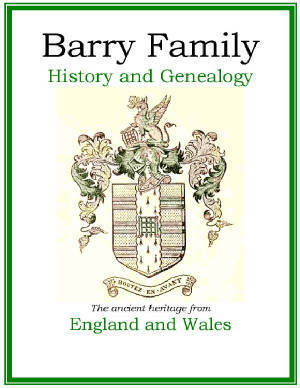 This publication has remarkable historical documentation dating back to the 11th century on the Barry Family in ancient England and Wales. There are detailed genealogical pedigree charts from several family lines, parish registers, and copies of various wills from the 16th, 17th, and 18th centuries providing names and dates. The Grant of Arms to Charles Barry Esquire is validated, and there is a 7 page index of over 250 ancestral members! An excellent genealogical resource for kinship ties and the family legacy! Price $6.95 USD. Dickey Family History and Genealogy. PDF eBook English 17.0 1898. This publication documents the Scotch-Irish background of the Dickey family who emigrated from Northern Ireland to the American colonies prior to 1730. They were seeking religious liberty as Presbyterians whose distant roots were from Scotland. 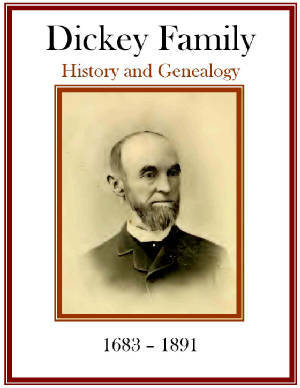 Essential dates and names of descendants range from 1683 to 1891 with 7 generations of Dickey family members. There is a 31 page index listing thousands of people both descendants as well as in-laws! A great resource for Dickey genealogy! Price $6.95 USD. Ferris Family History and Genealogy. PDF eBook English 2.70 MB 1895. Nine generations of Ferris Family members, stretching from 1635 up to 1895, are documented in this excellent resource for genealogy information. There are Last Will and Testaments, which provide many interesting details about immediate families, as well as a roster of Revolutionary War veterans that came from the Ferris family. 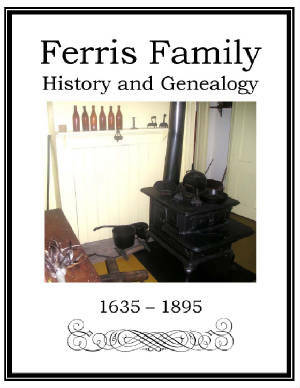 This is a great resource that covers a 260 year period of Ferris family genealogy! Price $6.95 USD. Goddard Family History and Genealogy. PDF eBook English 1.33 MB 1917. William Goddard immigrated to the American Colonies in 1665, and his wife Elizabeth nee Miles was soon to follow. There are 9 generations of their descendants, which span the centuries from 1665 up to 1916, providing a 251 year genealogy in this detailed account! This 28 page publication may contain unique information for the Goddard family genealogist to extend kinship ties back for centuries! Price $6.95 USD. 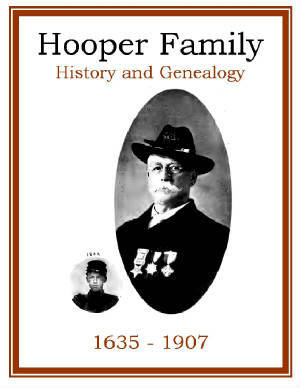 Hooper Family History and Genealogy. PDF eBook English 13.5 MB 1908. William Hooper AGED 18 YEARS came in the ship JAMES from London to the American Colonies sailing July 13, 1635. Vital dates, and names, are given from 1635 up to the year 1907 on Hooper family descendants along with information contained in Last Will and Testaments. 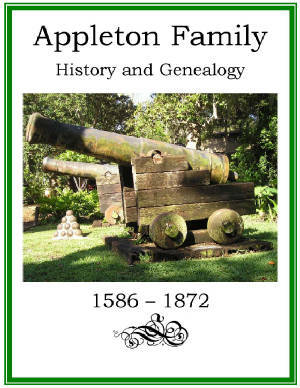 This is a great resource for Hooper family genealogists to document family households over a 272 year period! Price $6.95 USD. Latimer Family History and Genealogy. PDF eBook English 2.88 MB 1919. This detailed composition is in three divisions. First, the direct line from Robert Latimer, Sr. down to Joseph Latimer and the move from Connecticut to Tennessee (in the USA) of Colonel Jonathan Latimer and family. Second, the immediate family of Joseph Latimer and their settlement in Illinois, and then the family and descendants of George Griswald Latimer. Vital dates, and names, range from 1660 up to 1918 for a period of 258 years of genealogy! 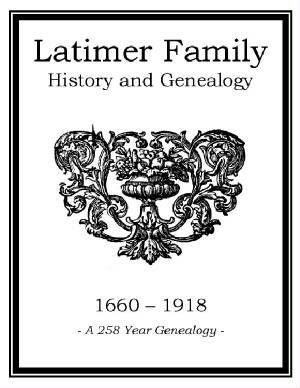 A great resource for the Latimer family genealogist! Price $6.95 USD. Mann Family History and Genealogy. PDF eBook English 3.52 MB 1873. On horseback the Mann family traveled through the pathless New Hampshire wilderness in October of 1765. With a great pioneer spirit they carved out their homestead and raised a family. Some poetry is included in this remarkable history with essential dates for descendants ranging from 1650 up to 1871. 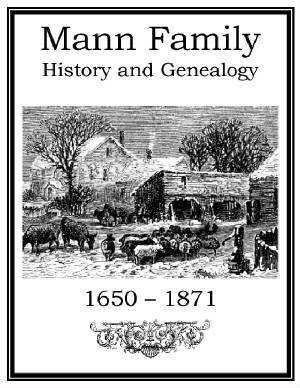 Although only 25 pages in length, this is a wonderful history for the Mann family genealogist. Price $6.95 USD. 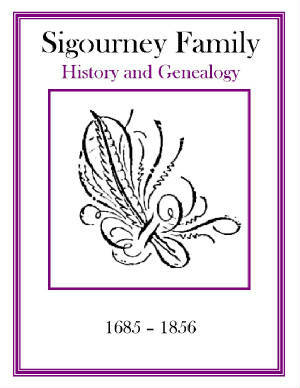 Sigourney Family History and Genealogy. PDF eBook English 1.29 MB 1857. Andrew Sigourney was a Huguenot who sought refuge in the American Colonies from the Edict of Nantes issued by King Louis XIV of France. Essential dates of the Sigourney descendants range from 1685 up to the years just prior to the War Between the States in 1856. Although only 29 pages in length, this is a fascinating journey back in time, and is a great resource for the Sigourney family genealogist! Price $6.95 USD.